A 22-year-old bicycles solo to all 30 MLB parks for youth mentoring programs. Around the U.S. in 180 days. On April 6, a man named Matt Stoltz began a solo bike ride from Safeco Field in Seattle, Washington to Miller Park in Milwaukee, Wisconsin. However, he will not go the most direct route to the home of the Brewers, but rather take a detour and visit all 30 Major League Baseball stadiums. This difficult task has a purpose that goes beyond every baseball fan’s dream; Matt wants to raise both funds and awareness for Biking for Baseball and Big Brothers Big Sisters (BBBS) of Metro Milwaukee. Biking for Baseball is a non-profit based out of Denver, CO that connects youth with mentors through cycling and baseball while directing attention to BBBS clubs across the nation. This trek is more than 11,000 miles long and will take about six months, or 180 days to complete. As of July 17, Matt has made it halfway through his journey by stopping at number 15 on his list: Turner Field. He has traveled over 7,500 miles to get to the home of the Atlanta Braves, where he watched the series opener against the Chicago Cubs. With around 5,000 more miles and 3 months to go, he’s not done impressing us quite yet. As stated on Biking for Baseball’s website, Matt is a 22-year-old Wisconsin native who has a history of charitable tasks, but nothing close of what he is currently doing. Matt rode a train from Wisconsin to Washington State to start his mission, shortly after attending a Biking for Baseball clinic in Milwaukee for BBBS, which he posted about in his blog on Biking for Baseball’s site. He also said he was nervous, but very determined. Nothing would get in his way. In addition to staying in hotels for this trip, Matt also stays with host families, whom he mentions in his blog. He’s met a lot of people while traveling from ballpark to ballpark, some who have even bought his ticket to watch the game. While this ride is solo, he mentions having a few riding companions keeping him company for a small portion of his trek. Matt also talks about his love for the Milwaukee Brewers, and he has been able to see them play along the way. While he posts to his blog every couple of days, he also posts to the website Reddit.com, in the subreddit /r/baseball, where he has gotten a lot of positive response. To keep up with Matt’s blog, visit www.bikingforbaseball.org/blog/. While visiting all those stadiums via bicycle is impressive on its own, it is also impressive that he planned the most efficient route he could while making sure he could attend at least one game in each ballpark. His next stop is Cincinnati, where he will watch the Cubs again, but this time against the Reds, obviously. For the remaining fields, he’ll have shorter trips in-between, but that does not mean he doesn’t need our support. 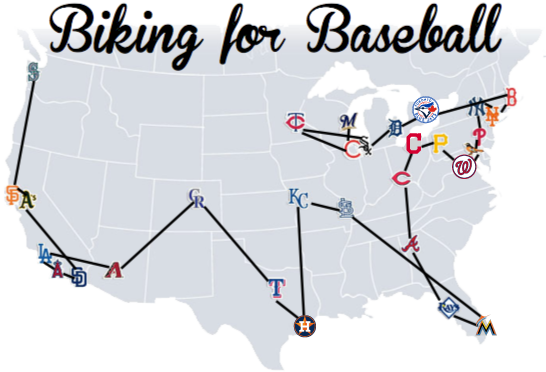 To see where Matt is headed next, and how soon he will be there, visit www.bikingforbaseball.org/live-tracking/. Matt Stoltz’s mission has a purpose even greater than accomplishing this task: to benefit Biking for Baseball and Big Brothers Big Sisters. To monetarily support his cause, visit www.bikingforbaseball.org/donate/. Another way to help benefit these programs would be to find out about becoming a mentor for a BBBS club or attending a Biking for Baseball clinic. If your favorite team is still on the list for Matt to visit, be sure to keep an eye out for a man with a bike wearing a Brewer’s hat. It’s probably this awesome guy.